Picking up exactly where last week’s episode ended, we get an interesting setup for Lance Hunter’s character, a returning character from last season, and a step forward in the season’s story arc with the (real) first-time appearance of someone that we’ve heard quite a bit about. It also has a really, really appropriate title. The car that the new guys were escaping in crashed last week, apparently killing both Idaho and Hartley, and trapping Hunter’s leg in the wreckage. May pulls up on her mysteriously acquired motorcycle and gives him some kind of blowtorch to cut himself out with before heading off after Creel, at Hunter’s insistence. Of course, the second that Hunter cuts himself loose, he gets captured by the military. There’s actually kind of an interesting dynamic set up here as a result of his behavior at the end of last week’s episode–he’s clearly very attached to Hartley and doesn’t care very much for Coulson, having broken ranks and not followed orders. I could easily see him choosing to place the blame for Hartley’s death on Coulson and turning traitor, which very much works in the episode’s favor. The only thing that really takes away from it is that I already know he’s supposed to be a main cast member this season. Such is the world of promotional materials, so we can hardly blame the show for that. 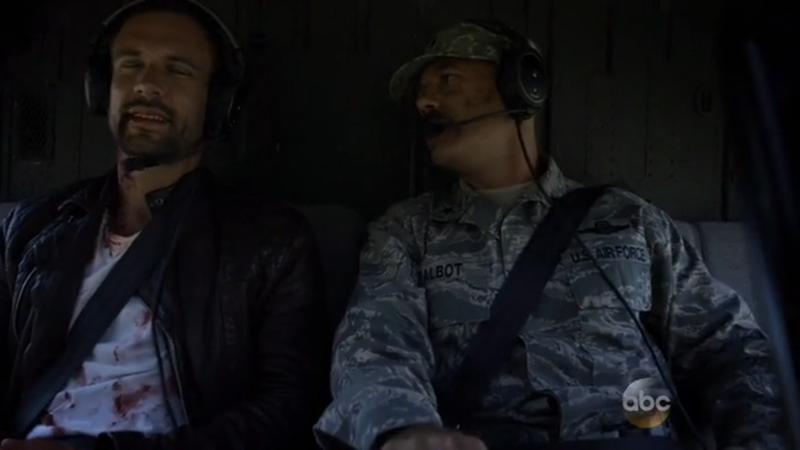 May chases down Creel on the motorcycle while briefing Coulson on the situation, and he’s none too happy to hear it. Still, he orders her to stand down, much to her chagrin. She ignores him initially, chasing down Creel’s stolen truck in broad daylight and pointing a gun at him, but Coulson finally gets her to “go dark” by explaining that he wants to find out who Creel is working for. This is another interesting point; May seems to have a bit more personality to her than she did throughout much of last season, manifesting through a slight hesitancy to fully trust Coulson’s decisions and an almost vengeful desire to take Creel down. Could it be after effects of using the Berserker staff once again in the finale? Anyone who watched Stargate Universe will know that Ming Na Wen certainly has the skills to play a deeper character, making this a welcome change. Skye tells Coulson about the 084 and how it sprouted the same symbols he’s been obsessed with, and is underwhelmed by his response. He’s a little more concerned about the captured Lance Hunter spilling the beans on their location, though. And speaking of Hunter, we immediately see him get tossed out of a car into the middle of nowhere, where a (surprisingly quickly dressed) Talbot emerges and “invites” him aboard a helicopter. Talbot swears he’s not doing the good cop/bad cop thing, but he definitely is–and Hunter says that, for $2 million and a proper, honorable burial for Hartley, he’ll give the military Coulson. A small Peggy Carter cameo as Coulson looks up the file on the 084. Fitz, Trip, Skye, and other surviving new guy Mack look over the cloaking device they managed to steal, trying to see if they can rig it (or better still, copy it) for use aboard the Bus. More Fitz sadness occurs, and Mack, even without knowing him the way the others did, tries really hard to treat him normally. They’ve really stepped up the characterization all around, as you can see. But Fitz leaves, and they’re stuck trying to deal with it themselves. 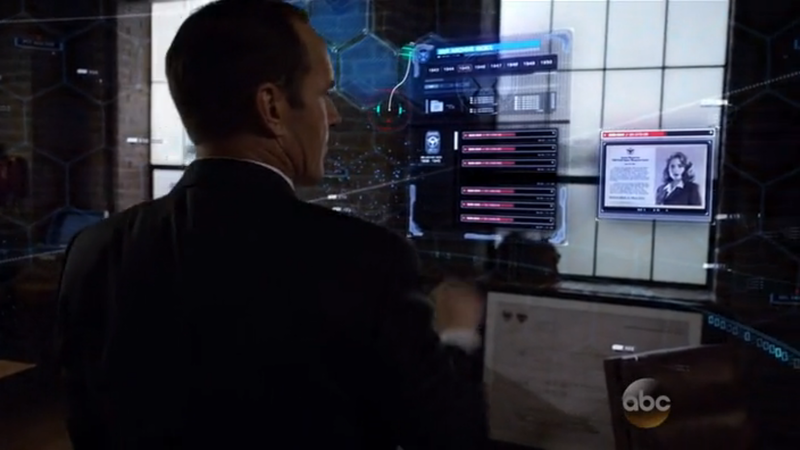 Coulson, meanwhile, is digging through the holographic interface of the box Fury left him, looking for info on the 084. He sends a message off, but it’s not clear if it’s to someone, or if it’s for an AI or just for himself later. Skye enters and tells him about the cloak, and tries to get back out in the field, but he insists May’s on it. Skye catches on and wonders about Hartley and Idaho–Coulson’s avoidance is answer enough on that front, and if she really wants to help, it’s time to go clean out Hartley’s quarters. Episode title’s starting to make a little sense now, huh? Creel’s at a diner hiding out, and it looks like his trick of turning his arm to rubber before grabbing the 084 has only delayed the inevitable. Worse still, the waitress accidentally touches his arm and begins turning to stone as well. The disturbance is enough to get May’s attention as she follows him and he runs off again. It’s worth noting that the waitress turns substantially faster than Hartley did, who in turn transformed to stone at a much faster rate that Creel is at this point. Perhaps the artifact’s effects are determined in part by how “gifted” someone is? At any rate, Coulson calls her back to base and once again blames himself, while crafting a paperclip into a shape that suspiciously resembles the alien writing. Then the perimeter alarms go off. It’s pretty clear at this point that he knows she’s not real. And given the next week preview, he may be in for a rude awakening. Surprise! It’s Hunter, being very open about his approach. Everyone kind of knows what the deal is here, and to his credit Hunter’s not really trying to trick anyone–he’s more interested in vengeance against Creel than money or anything else, and if Coulson can give him that vengeance, then he’ll be more than happy to tell Talbot off. Also he wants everyone’s backpay, for their families. 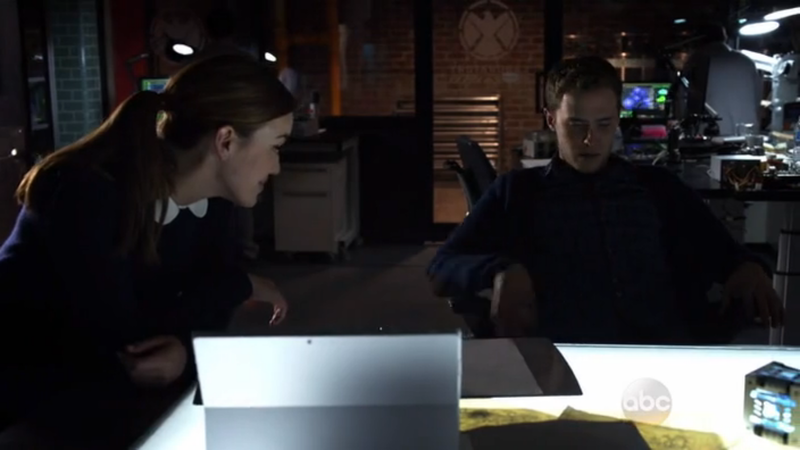 The hallucinatory Simmons talks Fitz into working on stopping Creel instead of the cloak, and “together” they take a peek at his oddly small DNA report. The other scientists have a plan that probably won’t work, but Fitz thinks he can destabilize the molecules that transform and effectively rob Creel of his powers. Mack walks in and asks Fitz who he’s talking to. Hallucinatory Simmons tries to respond, but Fitz’s answer of “no one” seems to indicate that he’s aware, on some level at least, that Simmons isn’t really there. But the hallucination tries really hard to come across as realistic, even going so far as to flirt with Mack (because even hallucinations can’t be exactly what you want. That’d be too easy to see through). Fitz finally comes clean and Mack agrees to help him work on the Creel thing instead of the cloak. I’ll just let you draw your own conclusions here. Skye’s packing Hartley’s things when Hunter enters the room. He explains that the picture she’s holding is of Hartley’s sister who’s suffering from cancer. It’s interesting to note here that at one point, they discussed possibly making Hartley a former lover of the late Agent Victoria Hand, who was killed in the Captain America 2 tie-in episode. I suspect that this was probably originally not meant to be her sister, but as the writers decided that they didn’t want to have immediately killed off the only two gay characters, they changed this to family instead. Everything makes a lot more sense when you know this little tidbit of information–Hunter’s seemingly unrequited feelings chief among them. There’s just something about the dialog that clicks better this way. Hunter takes a pendant out of the box and tries to talk Skye into leaving SHIELD, but to no avail. Creel digs through his sample drawer, but nothing he absorbs will erase the section that’s already turning from the 084. HYDRA gets in contact with him (rather dismissively, I might add) and tries to reassure him that it’ll be safe to deliver the obelisk to them at a new location. Creel tosses the phone in frustration, and that’s when Raina appears. An anti-villain character who first appeared early in season 1, Raina’s motives seem to be bound up in her apparently developing powers and her desire to understand them. She offers Creel a rare material in exchange for the obelisk, but he won’t make a deal with her. He’s convinced he needs HYDRA to save him (apparently taking “take care of him” at face value), but he keeps the material anyway, snatching it away and touching her in the process. 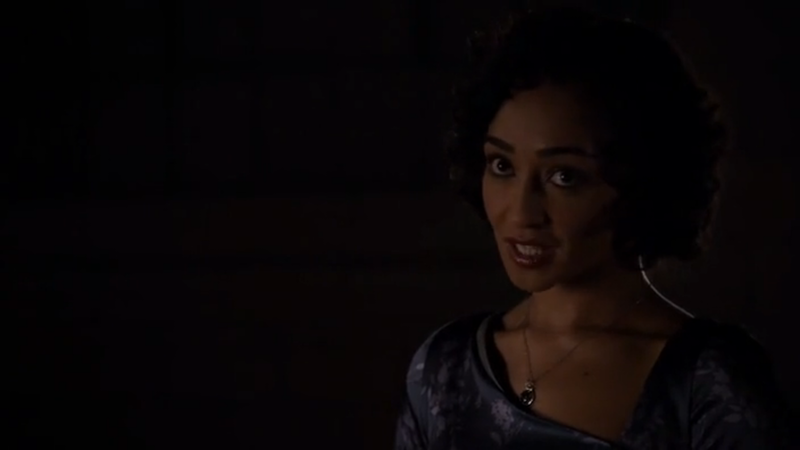 Raina expected he would, however, and implanted it with a tracking chip–a chip whose signal she passes on to Coulson. With it, the team puts together a plan, and they take a chance and decide to trust Hunter again to fulfill it. I didn’t really like her initially, but by the end of season 1 she got really interesting. 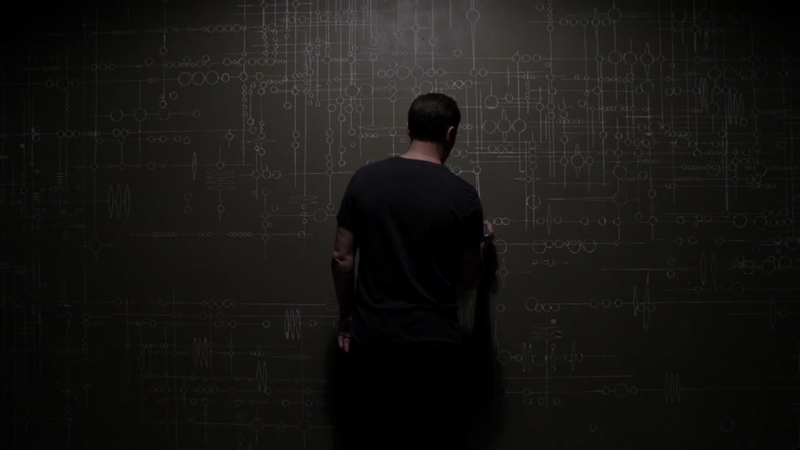 Mack is still working with Fitz, who keeps insisting that “he didn’t solve this today.” Which seems obvious, but it’s the emphasis on today–they’ve already seen something in the past that could be used against Creel, specifically the “overkill device” from season 1 episode “The Hub.” Mack helps him locate the plans and they’re able to come up with a version in time for the attack. Once they’re set up, Creel shows up at a park, where he sits down with a case beside him and makes the most obvious secretive deal ever. But things aren’t looking too good for our heroes. Hunter shoots both Skye and May with the night-night gun, and then moves up to catch Trip with it, too. As Creel’s contact uses some kind of brainwashing phrase on him, he appears to be healing and passes the case over. That’s when Hunter appears, carrying the giant rifle and aiming it squarely at Creel. The contact heads for cover, and Creel catches on in time to transform, causing the bullet to bounce off harmlessly. But in the mayhem, the case disappears, and Raina can be seen walking off with it. As Creel’s about to use the 084’s power on Hunter, Coulson sneaks up behind him and stabs him with the overkill device, destabilizing his powers and giving the artifact a chance to turn him into stone. Coulson’s no idiot, he knew Hunter might pull something like this. And yay, Fitz was able to help save the day. While Hunter did kinda betray them, his heart was in the right place and so Coulson’s willing to give him another chance, having arranged a proper funeral for Hartley. Also, this happens in front of Talbot’s face. Cloak’s working! But that’s not all. We see Raina deliver the obelisk to a man who’s soon revealed to be Skye’s father. He encourages her to touch it, which she (very hesitantly) does. Nothing happens to her, but the object glows orange and the writing becomes more prominent than ever before. When she asks, he says he’ll only explain to both her and Skye at the same time. This was a pretty good episode, continuing a lot of the positive trends set forth last week. The effects are still stellar, and Hunter is already a more interesting character than Ward, whose former role he seems to be at least partially taking on. The team’s not so straight laced these days, and these new characters are all very different and unique, which is exactly what the show needed after struggling with a general sort of “same-iness” last year. I’m very much looking forward to seeing this new team come together. Next week: “Making Friends and Influencing People,” which will see the return of the real Simmons and a few other familiar faces.